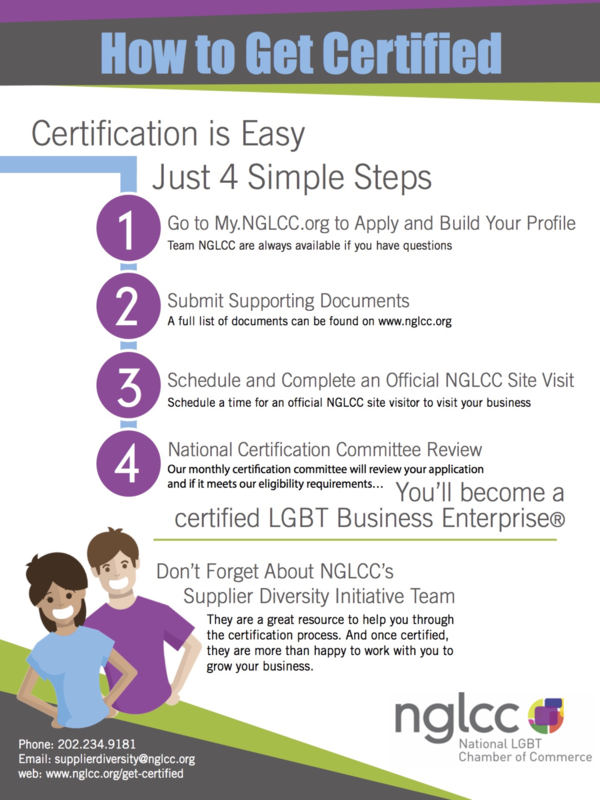 What is the NGLCC Certification Program? As a Richmond LGBTQ Chamber member, our partnership with the NGLCC, the National LGBT Chamber of Commerce, gives you access to the many programs and benefits available through the NGLCC. One of the most important benefits of our partnership with the NGLCC is your ability to take advantage of the NGLCC Certification Program – the NGLCC is the exclusive, third-party certification body that verifies that eligible businesses are majority-owned by LGBT individuals, and subsequently grants LGBT Business Enterprise® (LGBTBE®) designation to such businesses as part of its LGBT Supplier Diversity Initiative. Be sought after by NGLCC Corporate Partners who are looking to increase their spend with LGBT businesses. Build strategic relationships with IBA partners and members, corporate representatives, and supplier diversity professionals. Team with other LGBTBEs for exclusive contracting opportunities nationally and locally. Become eligible for scholarship programs, mentorship and leadership training, and other business development tools. Access RBA and NGLCC corporate matchmaking and networking events throughout the year. Majority (at least 51%) owned, operated, managed, and controlled by an LGBT person or persons who are either U.S. citizens or lawful permanent residents. Exercises independence from any non-LGBT business enterprise. Has its principal place of business (headquarters) in the United States. Has been formed as a legal entity in the United States. To obtain LGBTBE Certification the following overview/information are what you need to know to initiate and complete the Certification process. Review the list of required documentation necessary to begin the certification process. Ensure your RBA Membership is in good standing to receive membership benefit waiving the full certification fee (a $500 value at no cost to you!). Contact NGLCC directly if your business is certified by the Women’s Business Enterprise National Council (WBENC) or the United States Business Leadership Network: Disability at Work (USBLN) – certification with these organizations makes your business eligible for expedited LGBTBE certification. Send required supporting documentation to the NGLCC. Undergo a mandatory site visit by a certified professional. Await application review by the NGLCC Certification Committee. Receive your welcome packet and celebrate! For questions, check out the Frequently Asked Questions on the NGLCC website, review this pamphlet, or contact the NGLCC certification team directly at (202) 234-9181.